If you enjoy eating sunflower seeds, nutrition is just an added bonus with this tasty snack. Sunflower seeds are delicious and healthy, and can be used in a variety of different dishes to add crunch and flavor. Sunflower seeds come from the center of the sunflower bloom and are encased in a hard black shell. The shells are edible, but many people prefer to eat the seeds without them. You can purchase sunflower seeds in a variety of ways, from roasted and salted to flavored. Can You Eat Too Many Sunflower Seeds? The healthiest way to enjoy them is raw and unprocessed as all of the sunflower seeds nutrition will be intact, and you won't be ingesting added salt, oil, and chemical flavorings. 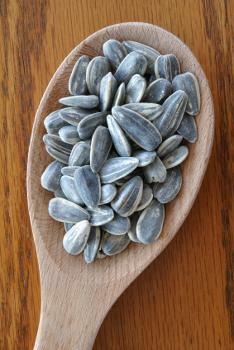 Sunflower seeds also contain 13% of the daily recommended intake of iron, and are completely free of cholesterol. Sunflower seeds are a terrific source of vitamin E, which acts as an excellent antioxidant. Vitamin E protects cells and membranes from disease and damage, and aids in the fight against heart disease and certain cancers. The B complex vitamins are also present in sunflower seeds, particularly vitamins B1 and B5. Vitamin B1, also known as Thiamin, helps to convert sugars into energy. It also helps with muscular and cardiovascular systems, keeping them all functioning well. Vitamin B5 breaks down fats, protein, and carbohydrates. It's easy to add sunflower seeds to your diet, either alone or as part of a recipe. Here are some simple ways to enjoy them. Grab a handful of sunflower seeds as a snack, or add them to a mix of nuts and dried fruits. Sprinkle shelled sunflower seeds over a salad. Add seeds to cooked oatmeal for a nutty crunch, or stir into yogurt with some chopped fresh fruit for a tasty breakfast or snack. Add a small amount of toasted sunflower seeds over steamed vegetables, such as broccoli or asparagus. Use them in your favorite muffin or bread recipes to add a bit of protein and fiber. They can be stirred into the batter or sprinkled over the top of the bread or muffins before baking. Sunflower seeds taste great and pack a nice nutritional punch. Throw a handful of sunflower seeds into a small container for a portable snack on the go, which will give you a quick energy boost.